The Reeds U12’s age group runs one fully committed team with a full programme of league and friendly fixtures. We train Wednesday nights, 6.30pm to 8pm at the Reeds Weybridge Club Whitely Village. On Sundays we mainly play matches, interspersed with some additional training sessions. Home matches and Sunday training typically start at 11.45am. We believe that the Reeds U12’s age group is able to offer players, at all standards a great opportunity to learn and develop their rugby; to play competitive rugby at a level that is suitable for their ability; and to continue to be challenged as their experience and ability develops. This attitude and coaching support has seen the age group grow with new players joining regularly. We continue to look for new players and would welcome anyone considering Rugby. All we ask is for enthusiasm and commitment. We will do the rest! We also like to tour and over the last few years we have visited many parts of the country and we will be touring this year too. Tour is a fundamental part of Rugby life and provides an opportunity for some bonhomie, tour court and a chance to play different teams. This is our first year of league rugby which takes place within the Waterfall Cup, we continue as a 12 man game. 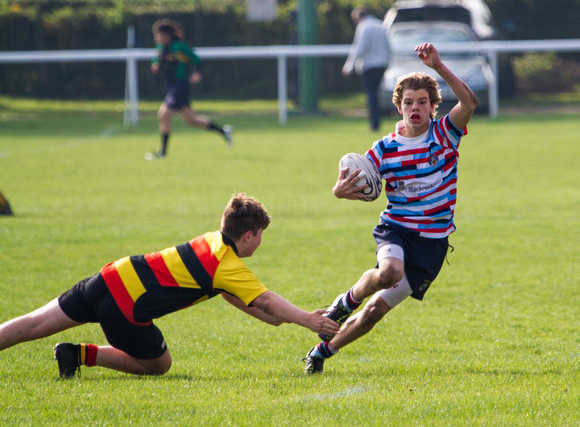 We will play within the development of the Age Grade Rugby as set out by the RFU. The Reeds U12’s age group is supported by 5 coaches and a world class ref. All coaches are Level 1, 2 or 3 qualified and involved in a continuous programme of training and development supported by the Reeds club and the RFU. We also leverage specialist coaching resources within the club, when required. We focus on developing player’s core skills, to enable them to play effectively at several positions. We want well rounded players and whilst positional play in matches is important we develop all players in all skills. Please give Reeds U12’s a try. We are very keen for new players to join the Reeds U13’s age group. All players of any ability will be made to feel very welcome. Over the last 2 seasons we have made a big effort to play some new teams, both in Surrey and in neighbouring counties. We would be very pleased to host any new teams or to travel to your ground. We know that touring is important for most clubs, and as such our coaches, parents and players all make a big effort to create a memorable day when hosting touring teams. Reeds Weybridge is blessed with some fantastic playing facilities. Flat, well maintained, quick draining pitches ensure that we can train and play throughout the season, whatever the weather conditions. Match quality lights were installed at Reeds Weybridge during the 2013-14 season which allow us to provide high quality, mid-week training sessions even in the depths of winter. We always aim to organise a number of social events each year for players and the parents, outside of rugby training and matches.